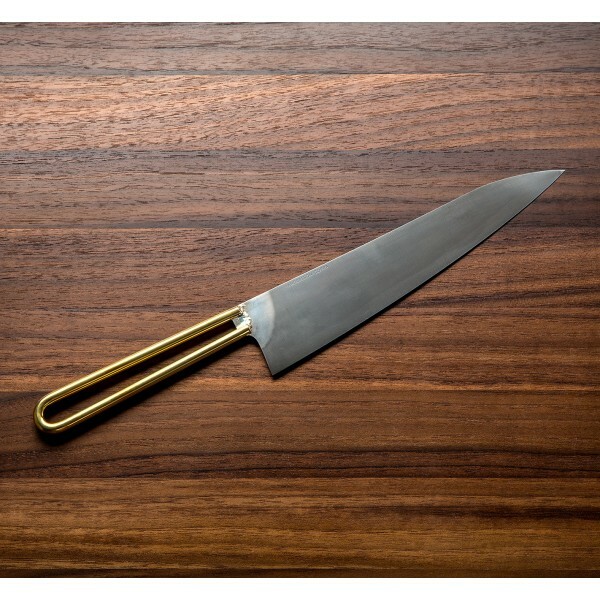 With the brass handle modeled after a handle style used long ago in simple utility knives, the Loop Chef has a personality all its own. 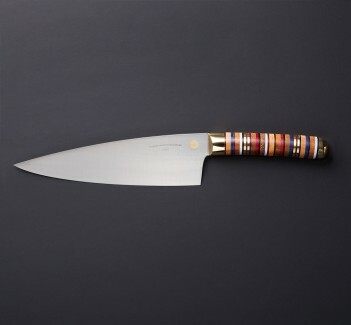 Designers Joel Andersson and Adisa Copra knew that the clean, light and comfortable design waranted a more elaborate version for use in the kitchen, and holding this knife, we absolutely agree. The carbon steel blade and handle are joined together with a hard silver solder, a detail that those who appreciate the craft will love. The 50/50 blade has a slightly convex grind that tapers towards the tip to a thin edge, and a forced patina gives a sharp and modern look to the Uddeholm UHB-20C carbon steel. As with the Loop Santoku and Loop Paring, included is the uniquely designed wooden transport case. Joel Andersson and Adisa Copra, the couple behind Andersson Copra kitchen knives, form each blade by hand on a water-cooled grinder in their small and humble studio in Gothenburg, Sweden. 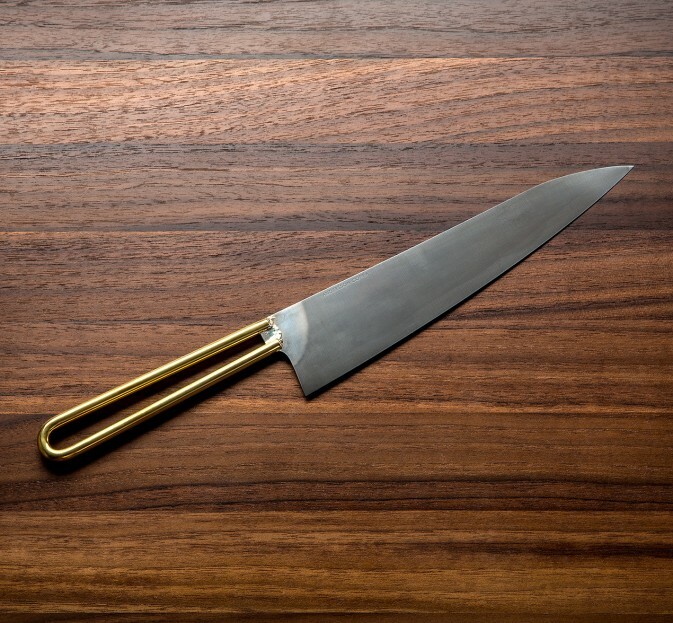 Striving for beauty in simplicity and superb functionality, Joel and Adisa have fine-tuned a design and approach that result in stunning knives that make cooking easy and fun. 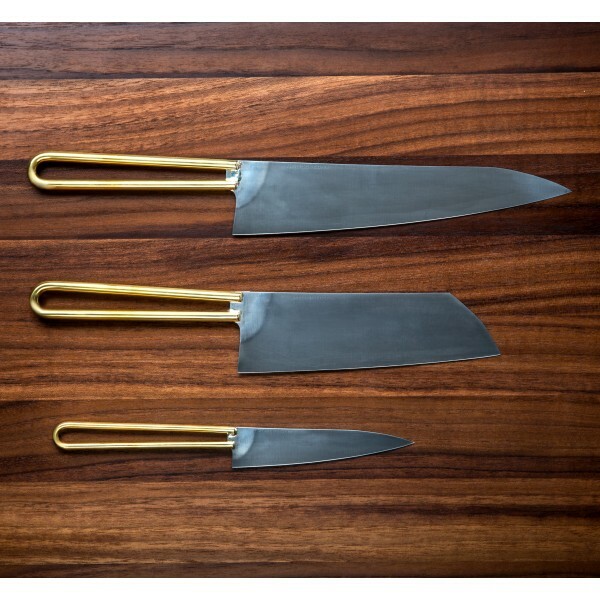 Artists comitted to their craft, this talented duo presented their handmade knives in Tokyo during the 2016 Design Week, and we look forward to seeing what they will come up with next! What drew me to this knife was the unique handle made from a thick piece of brass. 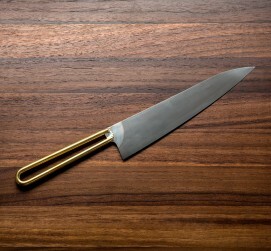 It is hard to explain how perfect the execution of this knife is without actually holding it in your hand. 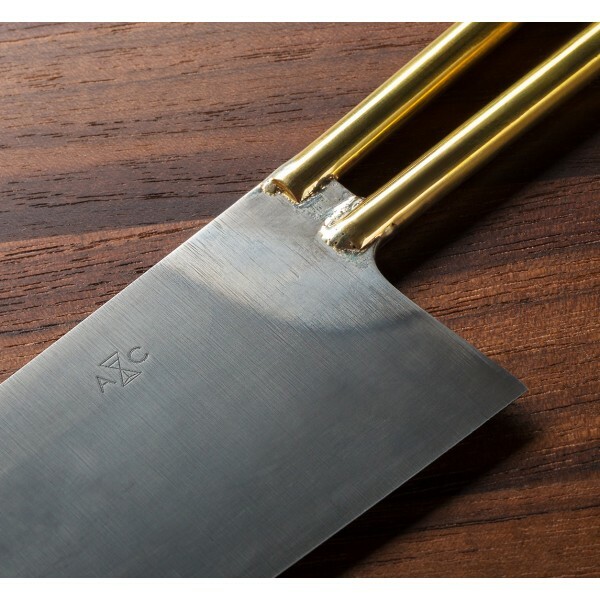 A superb length for most kitchen tasks, the geometry, grind, shape and balance are all exceptional!